I love chips. Potato, corn, poker, I love all kinds. (Buffalo? Well, okay, maybe not all kinds.) And if there's anything I hate, it's stale chips. 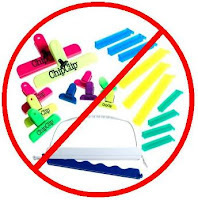 But I really don't like using those Chip Clips. They're expensive, hard to keep track of, and if I do happen to find one after digging through four or five disorganized kitchen drawers for 20 minutes, it's either too big or too small. There has to be a better way! Thankfully, someone out there heard my cry for help.